Good morning everyone! I have another exciting new card technique to share. This one is sure to wow your friends! For the step by step tutorial, scroll down the page. Just a reminder, if you haven't done so already, you can download a pdf document of ALL peachy keen and punch art projects ever shared on my blog. Click HERE to download. Today's Peachy Keen Challenge was to create a project featuring patterned papers. I am a paper addict, so this one was right up my alley! I'm so in love with the latest stamp release so I wanted to use them again. 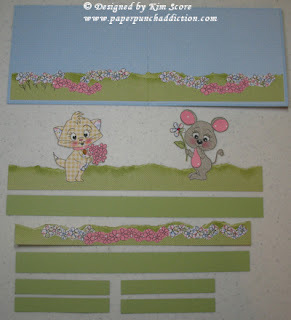 The kitty and mouse are from the PK-289 Mitsy Sue and Colby Cheer Up stamp set. I changed the faces to happy faces using the PK-291 Sampler Package of Faces set. The design team totally rocked on this challenge! You have to jump on over to the challenge site and check out the other awesome projects HERE. I recently created a video of this technique. Check it out HERE. 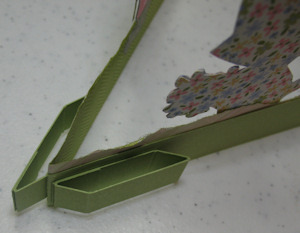 Fold card base in half and decorate inside before attaching any of the pop up pieces. 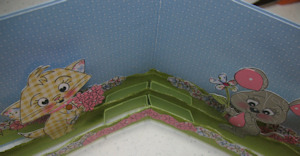 Create decorations for middle layer which will be attached before attaching the top pop up layer piece. 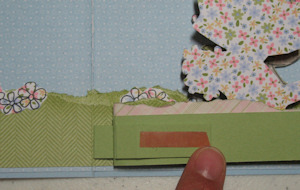 For my card, I created a whole strip of grass with flowers. You do not have to cover the pop up layer pieces like this. If you want to attach smaller pieces, you can. 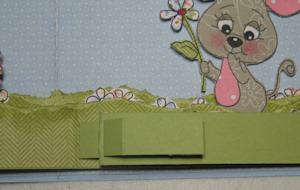 Keep in mind that this card will be rather thick when closed, so try to use thinner designer papers and embellishments. 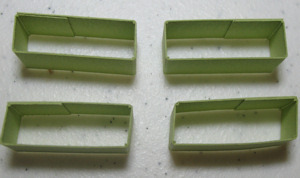 2) Score the four pop up support tabs at 1-1/8", 1-1/2", 2-5/8", 3". 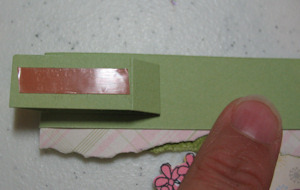 Apply strong adhesive to 1/2" tab on end of strip and attach to other end to form box shaped ring. 3) Fold the middle and top layer pop up strips in half. Attach decorations to front of each strip. Flip over to back side and attach the pop up support tabs on each side of the score line. 4) Fold middle layer strip in half, right sides together. Push pop up supports in the direction shown on picture. Apply sticky strip to rear pop up support piece. Attach to card base on the right side of center score line as shown. Add sticky strip to support tab on top as shown. 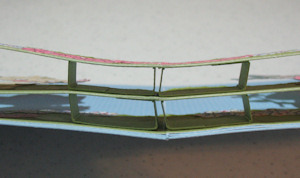 5) Carefully open middle layer back up and attach other support tab to the left of the center score line on card base. Repeat step 4 for top layer. Open up and attach other side to left of the center score line. The card will be thick when closed. I suggest wrapping a ribbon or belly band around the outside of card to keep it closed. To create the mouse and kitty, I stamped one of each on two different patterned papers. Then I cut out the ear and belly pieces on one pattern and glued onto the other stamped pieces. This technique is so easy but it looks so beautiful. This also saves the time to color the images in. Oh Wow! What a great pop up technique and Misty Sue & Colby look so gorgeous paper pieced! Love the wee flowers and the torn grass. What a fun card - I love it! Thank you for the great tutorial!